Serendipity is one of my favorite words and experiences. As a word, I love the story Joseph Campbell told Bill Moyers decades ago about its etymology. It seems there was a family on their way to a place called “saran dweepa” (“the island of silk” now known as Ceylon) who had all kinds of adventures on their way that made the moment more exciting than the original destination. Which is exactly what happened to me when I picked up a package of Bob’s Red Mill Millet Flour. 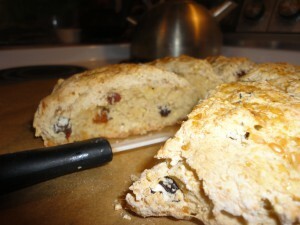 Etymology and experience met when my eye caught the recipe on the back for Millet Raisins Scones. I have a long history buying Bob’s quality flour products. When I go to visit Mike and Kelly in Portland, I love that I’ve gotten to visit the Bob’s store. When they come to visit me, they always bring me a 25 lb bag of gluten free oats they’ve picked up for me there. This time I’m hoping for a small package of spelt berries too. After all my fun with spelt flour, I want to see the whole berries and maybe try cooking or sprouting them. And as this post will demonstrate, spelt flour and millet flour are terrific baking partners. As much as I like Bob’s products, you’d think I would have learned that none of the recipes on the back of their packages fit the nutritional profile I need to follow, even on the gluten free flours. 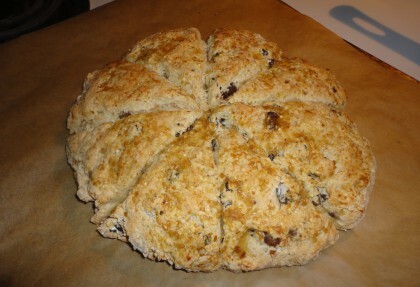 The recipe for Millet Raisin Scones was no exception. It has unbleached white flour, canola oil, sugar and 5 egg whites. Just after reading the ingredients most sensible people would give up. But I wanted to make a version of these scones I could eat. I know millet and raisins are yummy together. And I had made raisins from my next door neighbor’s grapes that were calling me to put them in a recipe. The hardest part of adapting the recipe on the back of the Bob’s package was a vegan alternative for 5 egg whites. I readied two different alternatives. The egg replacer directions for egg white and a flax egg I’d read about from a google search I did. They were at opposite ends of the density spectrum but I thought a combination might work. I also had to account for the fact that required liquid has to be slightly reduced when using spelt flour, which absorbs moisture and stays more wet than conventional wheat. And then there was the sugar. I have some coconut sugar I bought for something last summer and most of it’s going the same place the applesauce is going–into a cake for a community holiday dinner I volunteered to make some food for. I almost caved and added some, but I really wanted to see if I could make the scones sweet enough without it. It sounds like I was very precise, but actually I wasn’t. I took all this into consideration and I winged it. I’ll try to translate what delicious scones serendipity handed me into a recipe you can try. Bring some water to the boil for your flax egg. While it’s coming to the boil, make your 3 egg-replacer whites. (I used some water leftover from plumping the raisins. Let these sit while you mix the dry ingredients. If you don’t use prepared applesauce and want to try the pineapple, process the pineapple chunks in the food processor along with the banana and the soft dates (if the dates aren’t soft, soak them first too). Combine the pineapple and the tablespoon of maple syrup with about 1/2 to 1 tablespoon of the flax egg in a small bowl, and mix, along with the almond yogurt. The egg-replacer “whites” will be fluffy, so I just put them next to the other liquid in the smaller bowl and then folded everything in to the batter. I used my danish dough whisk to combine everything. Then flour your hands if necessary and pat the dough into a ball. Then put it in a floured surface and roll it out in a circle about 8 inches in diameter. (You can also just press it with your hands if you don’t have a rolling pin. Put your dough round onto a cookie sheet lined with parchment paper. Cut the dough round into 8 wedges but don’t move the wedges–just leave them there. Stir together about a 1/2 tablespoon of the remaining flax egg with a tablespoon of orange juice and a half teaspoon of maple syrup. Brush the tops of your scones with the “egg” wash.
Bake at 400 for 30 minutes. Let cool 5 minutes before serving. Notes: If you want to make these gluten-free, try substituting the 1 1/4 spelt flour with about 3/4 cup of a gluten free flour like sorghum or brown rice and 1/2 cup of tapioca or potato starch. Up the baking powder to 1 tbs. You could also try using gluten free oats ground into flour. If you actually want to use applesauce you can try that, but I think the pineapple really makes the flavor of these scones pop. Disclaimer: there is a negligible amount of “hidden” sugar in these scones, since the commercial almond yogurt, even the “plain” one that I used, has a little sugar in it. Tried a version of this with 2 1/2 tbs of poppy seeds and 1/2 cup of golden raisins and a dash of almond extract, which also rocked. Merry Christmas and Happy New Year, my friends. May your last days of the year be filled with delicious and healthy serendipity. yes, yogurt making does seem more like persnickety chemistry even than baking, and so, I have never tried it. I love your writing and always learn something interesting. thanks. Merry Christmas from Down Under….it’s not going to be too hot,thank goodness! Lovely name too. I love to look out at night and see the phases of the moon and, because we have no light pollution the stars are truly a wonder to behold and I gaze and marvel at the panoply before my eyes. I was wondering if you are another of those that just love to look up! I love to day and night for I find the changing shapes and colours, the movement of clouds, Sky and the many rainbows here entirely absorbing. Must mention scones…… I LOVE SCONES! I love millet and raisins and vegan AND GF. So it looks like I will be having no egg or yeast, deep relief not to to miss out and constantly substitute practically everything! Always a tweak to do but that is fine and I think the scones and I will be having a Hogmanay happy moment or three and inky skies clear of rain to give a light show for the occasion. Hi Airyfairycelt–yes, I do just love to look up! And an old friend told me she had read that looking up helps people who are depressed. That makes perfect sense to me. 🙂 I had to look up Hogmanay–so delightful to know it is the Scottish celebration of the new year! Glad my scones may be part of it. 🙂 A Happy Hogmanay to you! Our moon was lost last night! Must have been in there somewhere but the storms lately have been mad and so when heavy rains and buffeting gales in the inky black of our January well, it is about but just doing a good job of hiding. Kept warm in cottage, many around the south and still some with the lovely (but hugely expensive thatched) roof to be seen. If the thick walls are kept warm with the central fire it is cosy. So, another year and another scone! I love this recipe. I plump up my raisins with black tea, thinking of experimenting with green. The pineapple twist is wonderful and the working out of the egg white situation simply brilliant. I like a few chia seeds in a lot of things and wonder what you think to that? Hi Airyfairycelt–what a lovely description of the sky and your countryside and cottage in Winter! So glad you like the scones. I think you could make “chia seed” egg and put that in as well, or instead of the “flax egg” if you like. I’d use the flax egg in the “wash” for the top myself (I like the color, taste and texture of golden flax seeds for that), but I don’t see why chia wouldn’t work for that if you’re up to see what it’s like. Stay cozy! hi your recipe is great, but can you detail the instructions? you don’t say when to add the yogurt and you don’t list orange juice in the ingredients for the egg wash. and i used the egg ‘white’ in the wash not the ‘flax egg’. did i do that right? I made this today with some subs–I didnt have any millet so I made quinoa flour. And I threw in a whole banana. I also added a little sugar. It was great. Thanks so much for letting me know Corrin. This recipe is very forgiving in terms of there being room for play and variation, so I’m especially happy to hear that it worked for you with what you had on hand. Yay!